I have a new favourite quilt.... No, it's not one I've made. I will have makes to show soon though, promise. No, this is my new favourite quilt made for me by mum. I cant tell you just how much I love this quilt! I picked up a selection of Anna Maria Horner velveteens earlier this year in sales, with a nice cosy thick quilt for winter in mind. Not wanting to wait for winter 2015 I asked mum if she fancied making it for me! Fortunately for me, she said yes. Mum was quite taken with all the porthole blocks appearing, and she came up with a rather awesome design which would incorporate nice large pieces, and portholes too. I've been sitting here quietly, patiently, getting the odd update from mum for the last month or two, and now its finally here! So... wanna see? It is such a luscious quilt. So tactile, so soft, so warm. The colours are so vibrant too. Mum worried when she was making that it might be a bit much, as I had chosen the combination of prints on price not compatibility, but when you see the quilt in person its not that way at all. I absolutely love it! There's just so much to keep looking at, and you notice different parts of quilt design each time you look. Its bound and backed with a really lovely raspberry flannel (another double duvet sale bargain!). And what a back it is too! 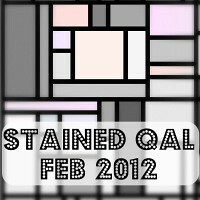 Inspired by another quilt I love. Love the trees. And the quilting too, like pathways meandering through a forest. I love this photo. I told mum I was going to blog it and say "spot the pinkie finger". She said "what makes you think its *that* finger...."
I love my new quilt. It goes on my bed every night, and I take it down to the sofa every day too. In fact, I think I might just spend the entire winter wrapped up in this quilt. Wont I look stylish? It'll no doubt save my man some pennies on electricity too - so its not just making me happy...its earning me brownie points too. Bonus!!! Gorgeous. 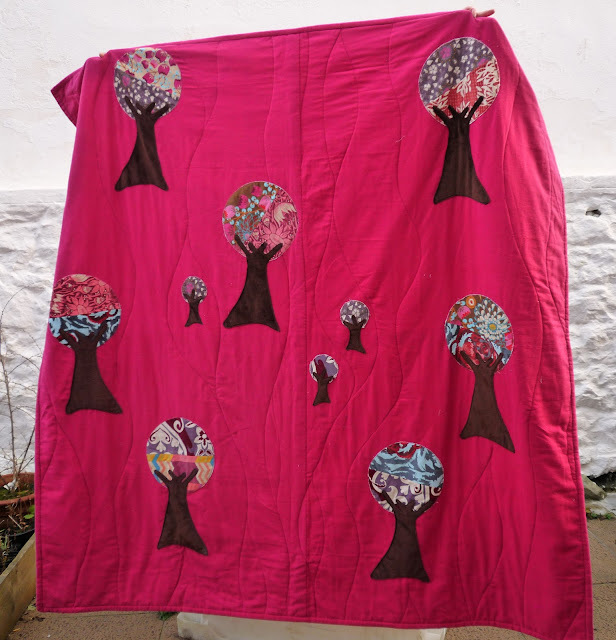 I LOVE the back of this quilt especially! Aren't quilting Mum's great. Way to go mum, it's just delightful! Lucky girl! Your mom is very talented. :) I bet those velveteens are the softest too. Wow, it is wonderful! I love all of it, the design and the fabrics, the back especially and the quilting. Your mum is the best! Handmade gifts are the bestest ever. With that quilt, you will always be wrapped in love. How have you been since Blogtoberfest? I just wanted to let you know that I'm hosting another (albeit gentler and more introspective) blog challenge over the month of December called #reverb12. Beautiful quilt & lucky you to have such a great Mom. The quilt is stunning. What a great design! And I don't think that is your mum's pinky finger either. that's gorgeous, and I bet it is incredibly cosy. Lucky you! Absolutely beautiful Sarah - it looks luxurious. Waaaaaaaah!!!! This quilt could have been made for me - it's just unbelievably flippin' gorgeous!! What an amazing mum you have (but then you already knew that)! Enjoy your quilt and love your proposed blog title. That looks gorgeous! What a fabulous quilt. It sooooo stylish that you will be able to stay in your Jammie's all winter! Great job mum!! Really gorgeous - what a clever mum you have!!! Just what every girl needs in a cold Shetland winter! Ooooh I bet that is just LOVELY to snuggle under! I'm going to email this post to my mom. Hopefully she will get the hint, lol. Gorgeous, gorgeous, gorgeous! And the back is almost better than the front! The trees are really cool. Oooh, gorgeous, well done Jenny, amazing job! You'd be needing it today if it's been as cold there as it has been here, -3 all day! Just gorgeous! Well done Jenny! No hibernating just yet, seems you still have work to do! 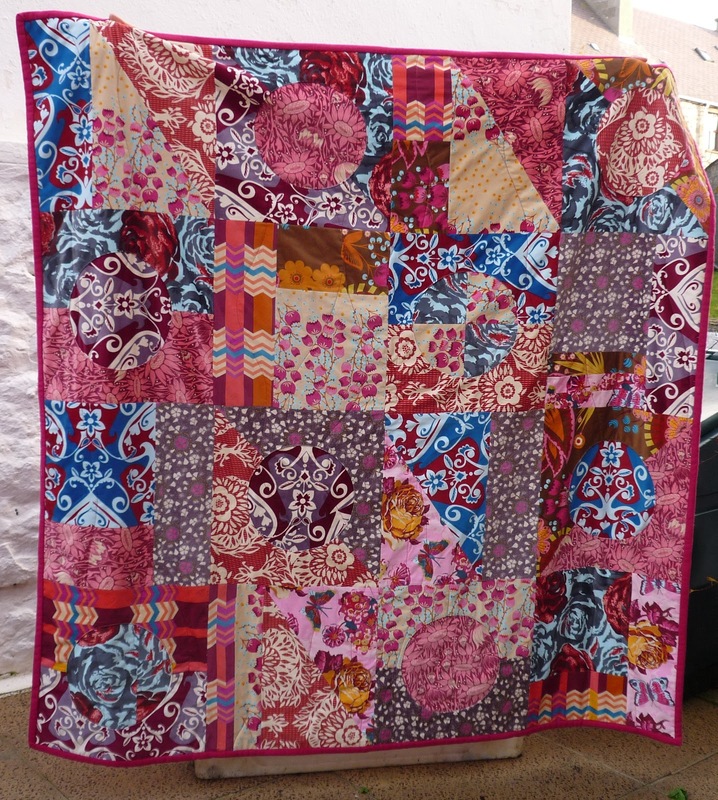 Wow - it's a double A side quilt! I think I'd spend the winter wrapped up in it too, if it were mine.